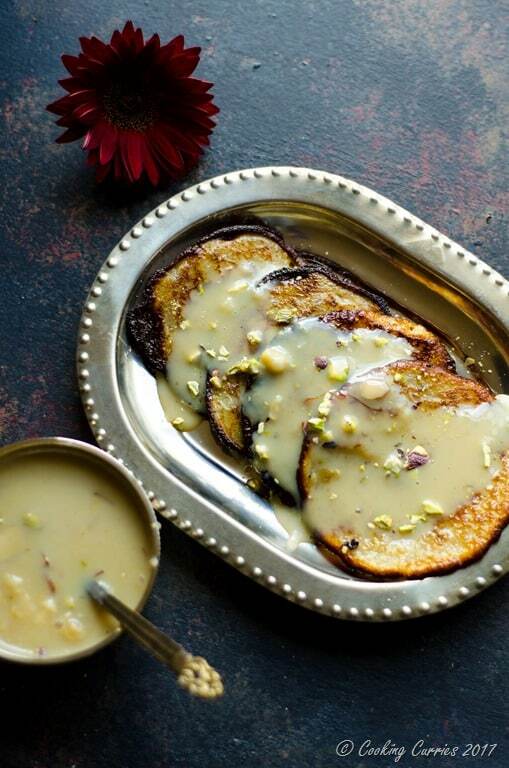 Heavenly little fried pancakes topped with sweet thickened milk poured on top of it, this Indian dessert of Malpua with Rabri is an experience in itself! The first ever thing that comes to my mind when I want to tell you all about this most delectable dessert is that – it is not as difficult as you think it is. 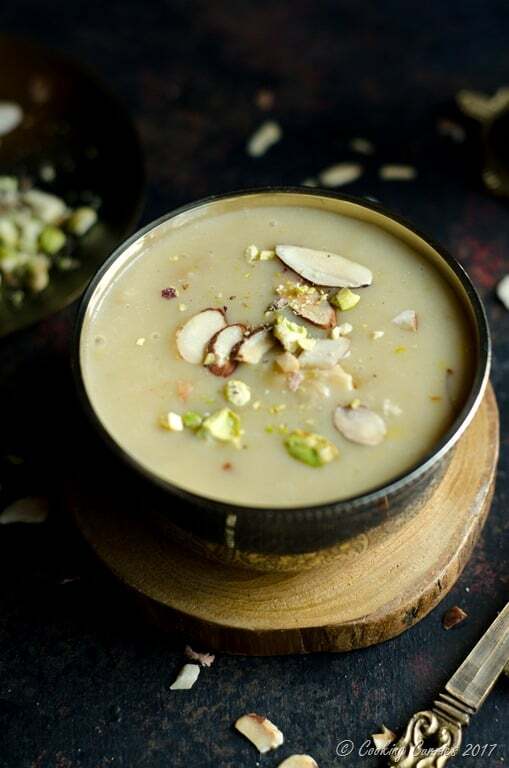 It is in fact, one of the easier Indian dessert recipes you can make! My first experience eating Malpua with Rabri was at Rajdhani restaurant in Chennai, India. It is a Rajastani themed fine dining restaurant, where everything is served in a silver platter and you are given an almost royal treatment. And the best part is, it is all unlimited food. Not buffet style, but they keep serving you with whatever on the thali, how much ever more of it you want. My brother and I loved (still love) going there! 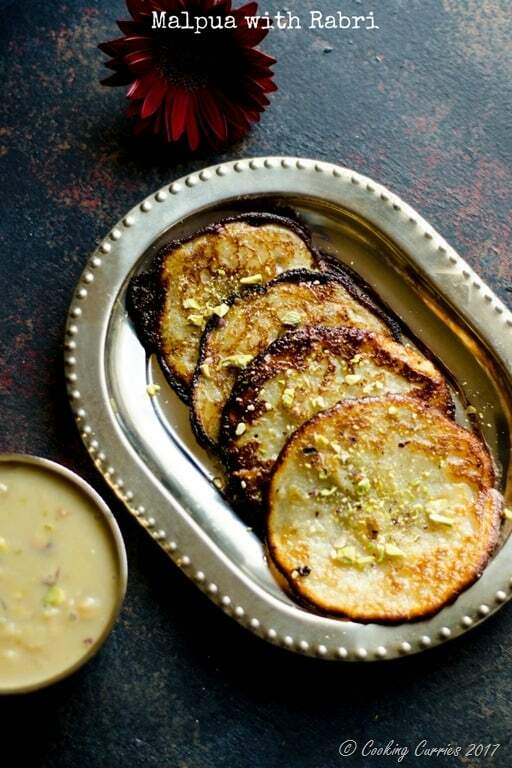 Our favorite part is when they serve the piping hot malpua (the pancake part) dripping with ghee and sugar syrup and spoon over the thick almost custard like rabri. It is sweet as h@#$, but tasty as nothing else you have eaten! Seriously, I am not exaggerating. I think it has something to do with that hot and cold combo, both sweet things, you know! 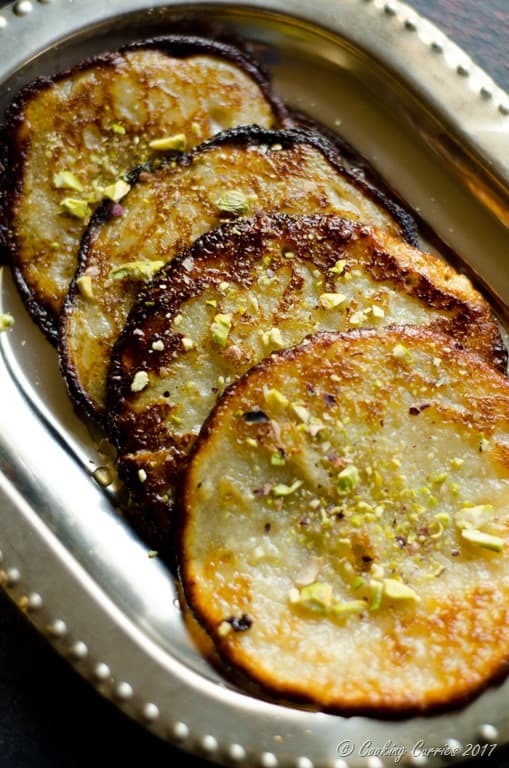 Like hot gulab jamuns or piping hot gajar ka halwa / carrot halwa with cold vanilla ice cream, or hot hot jalebis and this malpua with cold rabri. I am being taken into dessert heaven as I write this! So, let me stop it here. You got the idea right? Lets move on to the recipe then! You can find the recipe for the Rabri here. Bring the sugar, water and cardamom to a boil and let it boil for 3-4 mins and the sugar is all dissolved. Mix together the ricotta or paneer, flour, semolina, condensed milk and water together to a smooth batter. The consistency should be like a pancake batter or a little thinner. Heat about 1/4 cup of the oil / ghee over medium heat. Pour about half of 1/4 cup of the batter over it. It will spread out a little by itself. Once the sides start to crisp and brown a little, flip the malpua over and cook for a minute or so. 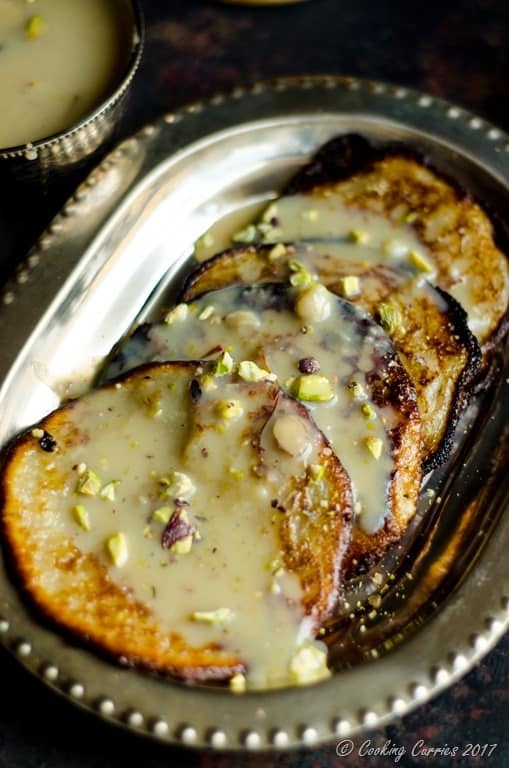 Pick up the malpua with a tong and immerse it in the prepared sugar syrup. Proceed with making the next malpua. Once that is ready, remove the malpua in the syrup and place the new one. Repeat with the rest of the batter, it should make about 14-16 malpuas. Serve hot with cold rabri on top.